It's Saturday night here in Tel Aviv, and with our group having gone home early Friday morning, late in the day Mara and I went to welcome the Shabbat with many hundreds of Israelis, at the newest cool spot for young couples and families, the Tel Aviv Port. A Kabbalat Shabbat service, of all things, is held there each Friday in the summer, and it is a huge hit in this bastion of secularism. In the video below you'll be able to see the celebration of the Sabbath Bride's entrance, as we watched the awesome sunset occurring before our eyes. Maybe a thousand people were there, maybe more. Others hopped off with their kids to the juggler on the next pier, or for dinner. Few wore yarmulkes, and at times relatively few were singing along. But they were clapping and humming and tapping their feet, and their numbers kept growing. The service is run by Beit Tefila Israeli, a pluralistic, non denominational group that seeks to meld Tel Aviv's creative spirit with ancient Jewish traditions. Their prayerbook does just that, interspersing the traditional prayers (and they are all there) with poems and quotes by Bialik, Heschel, Naomi Shemer and a number of Jewish and Israeli sources - especially Israeli, since they want to be considered an indiginous expression of modern Israeli culture, not an import from elsewhere. They are most definitely succeeding. See their website here. Beit Tefilah Israeli is a young and fast-growing, liberal and independent community in Tel Aviv, which offers a meaningful context and venue for Shabbat and holiday services, lifecycle events, and Jewish-Israeli Identity exploration for a broad range of Israelis who seek a place for spiritual quest in prayer and activism in a communal and friendly environment. In its first two years of operation Beit Tefilah Israeli has gradually become a prominent feature in the world of Jewish culture in Tel Aviv, and in the everyday lives of its members. North American visitors will recognize the influence of non-Orthodox centers of Jewish spirtuality in the U.S., but it is so reassuring to see it happening here in Israel, far from the back rooms of the Knesset where politicians appear determined to ban all expressions of Judaism save one. So listen and watch the final verse of Lecha Dodi by clicking below, paying particular attention to the dancing and the joyous faces of the children. Seeing this made me anticipate with even greater excitement my return to TBE as we embark on a new era of creative and inspiring worship with our new cantor, George Mordecai, in just a few weeks. Innovative, participatory services have long been a TBE hallmark, and indeed our Israel group added to that legacy by welcoming the Shabbat one week ago, in, of all places, Jerusalem, overlooking the Kotel. 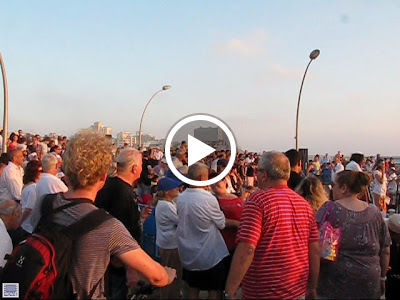 See the video below, and below that, see some photos of Friday afternoon in Tel Aviv Port, as the sun was beginning to set. Yes it can happen - even in Israel. THIS is our best response to the Rotem Bill. Click on the video below to see why.